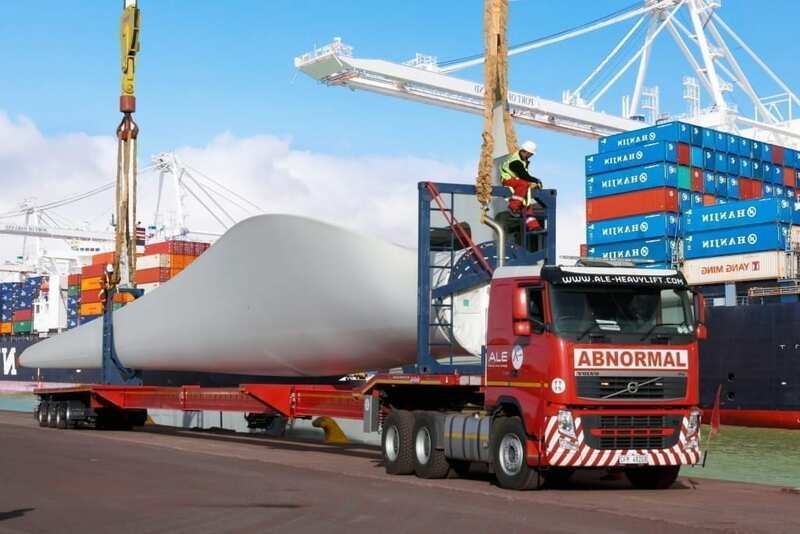 The Nooteboom OVB TELESTEP extendible semi-trailers are specially designed for the transport of ultra-long loads such as rotor blades, tower sections and steel structures. The OVB TELESTEP is equipped with a gooseneck and smaller tyres, which results in a load floor height above the tyres of approx. 1.20m, quite a bit lower than on the flatbed OVB TELETRAILER. Nooteboom has designed the OVB TELESTEP in such a way that even loads up to the maximum permitted fifth wheel weight can be positioned right behind the gooseneck instead of on top of it. The Nooteboom OVB TELESTEP is available with a triple or quadruple extendible load floor. A total load floor length of 55m can be reached when extended. In extended, unloaded position the chassis is slightly arched (cambered). This ensures that there is minimal sagging and that sufficient ground clearance remains. The hydraulic turntable steering with extremely large steering angle is ideally suited to handle the fully extended length. The pressure-relief system in the air suspension and an additional landing leg underneath the load floor make it easy to extend/retract these ultra-long load floors. In addition to the existing models Nooteboom also delivers custom-built versions of the OVB TELESTEP. It is available with more or fewer axles as well as load floors with more or less extension. The OVB TELESTEP can also be equipped with a fixed load floor as BALLASTTRAILER. And always with optimal steering and superior quality. The finish and conservation are of a very high level, the chassis being fully galvanised by means of hot zinc spraying. The OVB TELESTEP’s standard equipment includes TÜV-certified lashing eyes, stake pockets and manual steering.